Months before the JFK assassination, right wing zealots in Dallas demonstrated against the dangers posed by the Kennedy administration. 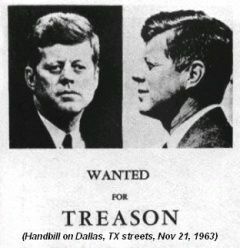 The pseudo mug shot (image below) accused Kennedy of treason. It appeared on the streets of Dallas, Texas prior to the assassination. The soon to be murdered president was accused of turning the Constitution over to a Communist United Nations; failing to register Communists; invading a "sovereign state" with U.S. troops (e.g., supporting court orders for the racial integration of schools); appointing "Anti-Christians" to government positions; and lying about his "previous marriage and divorce." The charge of "treason" plus the inflammatory content of the specific lies tarred Kennedy as a criminal and a danger to the country. The net outcome was to dehumanize the president. The mainstream media of the 1960's did not run these inflammatory charges. The level of personal attacks on President Obama echoes the extreme hatred directed at Kennedy. There are reasons that warrant a vigorous challenge to the current president on issues, tactics, and strategies. When the challenges come in the form of hate filled lies that the president is secretly a Muslim or that he's part of a new world order based on Marxism, the lies have the effect of inflaming the uninformed and bigoted. In the 1960's, the charges against JFK were published in extremist newsletters and offered at meetings by fringe political groups. Today, the inflammatory charges against President Obama and other Democrats are a part of the mainstream media via Fox Broadcasting and Fox News. Fox Broadcasting has been the number one or two in network over the past few years. The Fox News cable operation, which feeds some local Fox affiliates, is a consistent ratings leader among the cable networks. Lies viewed in print by a few hundred thousand in the 1960's are dwarfed by nonstop lies told on the Fox network to tens of millions every single day. Fox News hired former Alaska governor Sarah Palin as commentator in January 2010. She made her debut on the O'Reilly show and is a frequent guest of other talking heads on Fox News. While at Fox, Palin began a campaign to get rid of 20 Democrats in the House of Representatives. The Palin site is no longer operating. Sara Palin's web site featured the image above for the Take Back 20 campaign. The crosshairs are those that Rep. Giffords referenced in the video above. USA Today covered the campaign roll out on September 27, 2010. 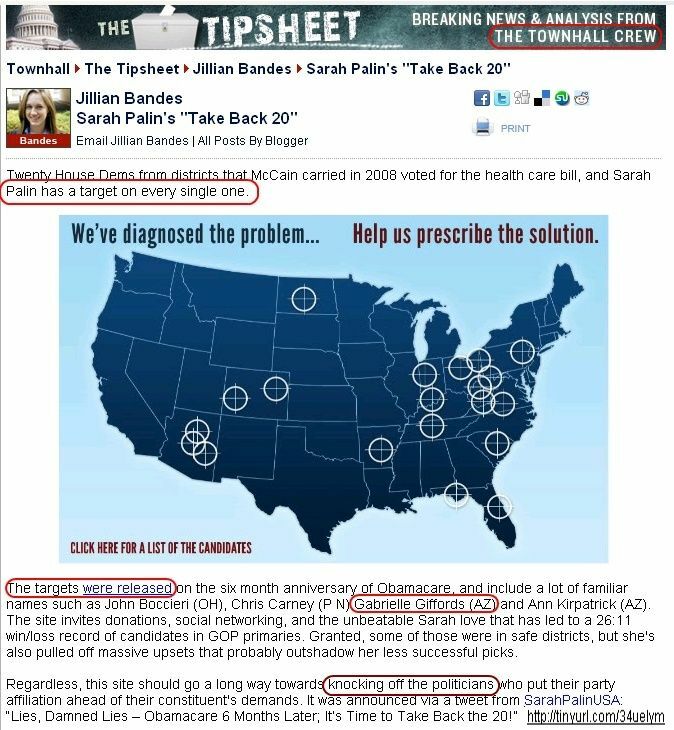 "In a website launched on Thursday, the six-month anniversary of the health care law, Palin puts a bull's-eye on 20 House districts under a headline that reads, "We've diagnosed the problem…Help us prescribe the solution." The link to Palin's Take Back 20 web page is no longer operating. Palin's active use of violent imagery and violent rhetorical phrases like targeting goes a step further than the defamers of JFK and President Obama. 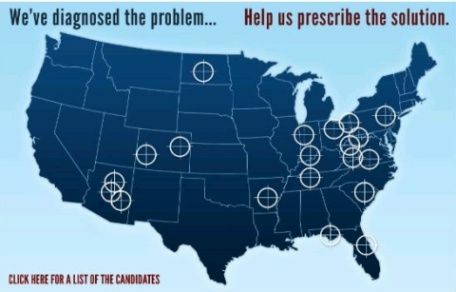 The images of a rifle site crosshairs are paired with the phrase, "We've diagnosed the problem. Help us provide the solution." While defeat in the upcoming elections was the goal, the entire approach to the campaign carried with it a violent violent double entendre. Townhall.com, a major right wing web site, ran an article endorsing Palin's campaign. Sarah Palin's "Take Back 20" presented one of Palin's campaign images, a map of the United States (screenshot). The map shows crosshairs, bulls eye images, over each of the 20 congressional districts, targets to be defeated in the 2010 congressional elections. This included Democratic Representative Gabrielle Giffords of Arizona. Unlike the charges against the two presidents, Kennedy and Obama, Palin's core factual claim was accurate. The 20 House Democrats up for election in 2010 had each voted for health care reform. However, the charges that preceded Palin's Take back 20 campaign were the same type of vile lies presented in the charges against Kennedy and Obama. The 20 targeted House members voted for a health care bill that created "death panels" to kill seniors simply due to their age. The votes were cast in support of a Muslim president bent on creating a Marxist world government. 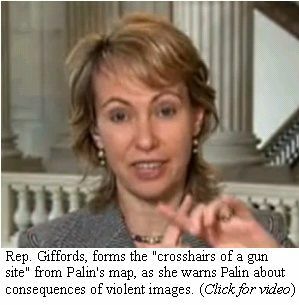 Ironically, Gabrielle Giffords made the strongest connection between Palin's violent images and real world consequences when she warned Palin of the consequences of her web site images and rhetoric. We don't need political assassinations to justify ending the climate of vile lies that has dominated the political landscape over the past two decades. Then again, we didn't need anti-abortion advocates killing doctors to demand that extremists end the charges that doctors performing abortions are "baby killers." We certainly didn't need presidential candidate, Senator John McCain of Arizona, singing "bomb, bomb, bomb Iran" when a calamitous attack on that country was a possibility. The purveyors of mass delusions tied to violent imagery and hate filled rhetoric are circling the wagons to defend their inalienable right to lie and inflame those on the edge of reality. Nothing much will change from the top. All the while, critical issues of war and peace and economic survival will remain perpetually on the back burner while the culture of violence erupts repeatedly. This represents an unacceptable and tragic distraction that points to our rapid demise unless leaders listen to the people of this country, who most assuredly, have had enough. You may reproduce this article in part or completely with attribution of authorship and a link to this article. One minor edit to Michael Collins' piece: I embedded the short video of Rep. Giffords discussing being on "Sarah Palin's targeted list but the thing is that the way she's had it depicted has the cross hairs of a gun site over our district" just below the quoted paragraph because seeing is, all too often, believing. I hope the diarist does not mind this minor change to this. It's there by clicking the pic but I'm glad you embedded it (I use the pic/link due to differing formatting I face). Feel free to correct any typo you see, as well;) I'll respond to your thoughtful piece in a bit.